On 15 February, the GMCC Business Women’s Network held a networking lunch at the Bridgewater Hall in central Manchester, gathering together almost 100 women from businesses of all types, shapes and sizes in this impressive setting. The event opened with a welcome address from the Rt Hon Beverley Hughes, after which three members of the Chamber’s Assembly took to the podium to report on January’s quarterly meeting, at which – unsurprisingly – Brexit had been high on the agenda. The translation industry was well represented, with all three Assembly members hailing from “our” sector of industry. Another topic of discussion – and the focus of this event – was the upcoming election of an inaugural Mayor for Greater Manchester. Over the 2-course lunch, the 10 guests at each table were asked to consider what they felt were the most important questions to put to the 7 candidates ahead of the election itself on 4 May. Discussions were moderated by each table host and then shared with the room in a short feedback session. The GMCC will be collating all of the information input by guests as part of its commitment to representing the views of its members as the election approaches. 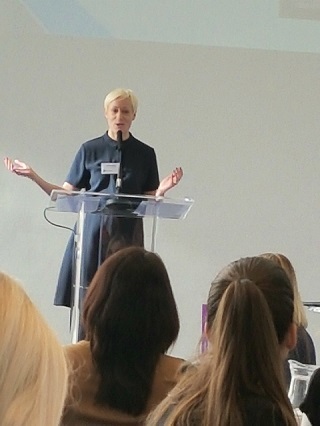 Our guest speaker was Natalie Atkinson, CEO of Curzon Ashton Football Club, who spoke about her experience of undertaking a high-profile role in what is still considered to be predominantly a man’s world. Natalie shared her vision for the football club and outlined the 5-year plan it has recently embarked upon. Proceedings drew to a close with the “60-second round” that will be familiar to those who have attended GMCC events. On arrival, attendees are invited to drop a business card into a hat for the opportunity to give an “elevator pitch” style presentation to the room. Having had her card pulled out of the hat at the last 2 events, Louise was hoping for a hat trick – in line with the day’s footballing theme – but it wasn’t to be on this occasion!